ADVENTURE and I LIKE TO MOVE IT was singing in our head when we decided to visit Fort Dauphin in the southeast of Madagascar in 2008. 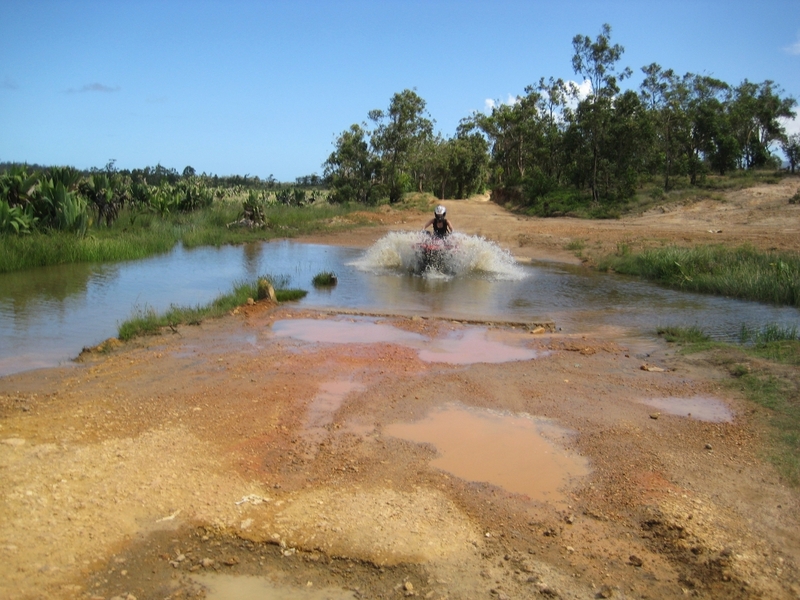 My husband and me love riding motorbike offroad, so we decided to do this as well there. Our whole motocross equipment found place in our luggage. The boots were part of the hand luggage and sometimes even the helmet. It was a challenge to pack everything in one backpack! Our flight was from Mauritius to Antananarivo, which is only 1.45h away. Air Madagascar is a decent airline and we enjoyed their service a lot. After 2 days in Antananarivo we wanted to taste the real Africa and flew to Fort Dauphin in the South. Directly on the seaside this small town is perfectly satisfied with itself. Until now on top of “The smallest airports we’ve ever been” is the Airport of Fort Dauphin. Not even a conveyor band was provided. 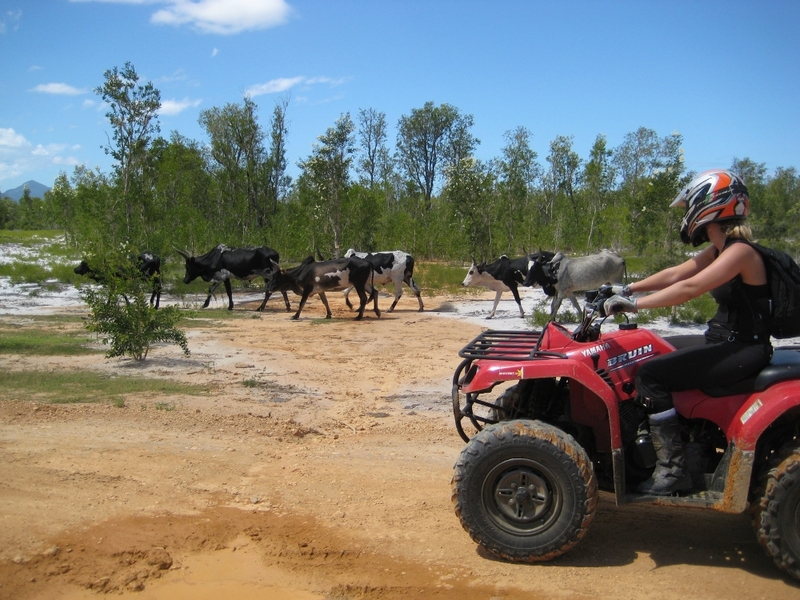 As renting a car is very costly due to the fact that cars can be rented only with driver we decided to go for Quads. An italian rental company (Trajectoire) is directly in Fort Dauphin – okay, what is NOT directly in Fort Dauphin? 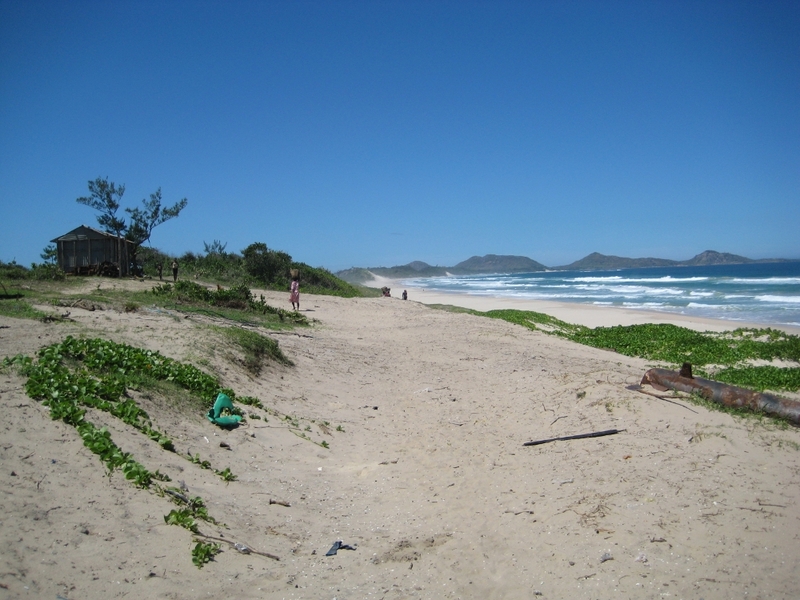 The beach in Fort Dauphin is endless. If you take a look at google earth you see more than 30km white, sandy beach without any hotels or other houses. We drove more than 20km on that white sandy beach. 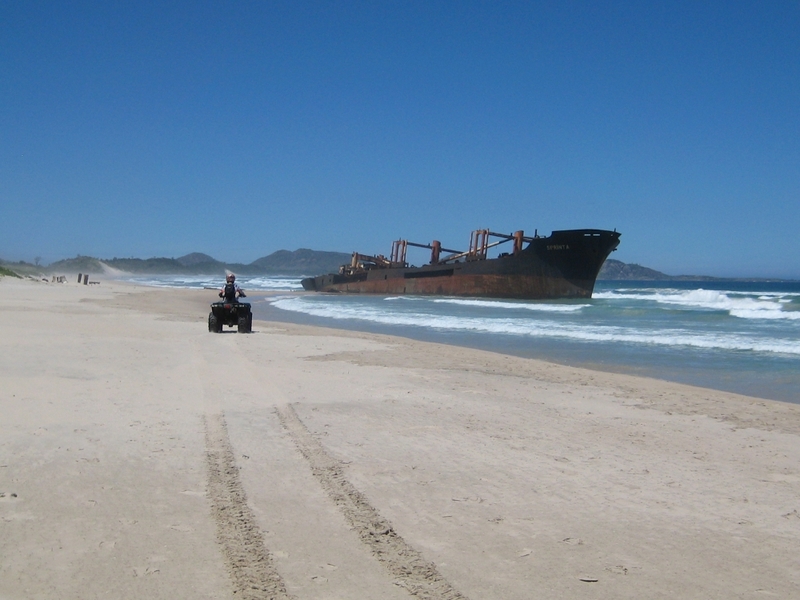 A huge ship wrack in the water remembered us of former times where eco tourism and sustainability weren’t yet on everyone’s lips. It seemed very unreal: the most beautiful nature, white sandy beach, nobody there but a wrack. Sometimes diligent fishermen walked by, although I would have to admit that they jogged by. 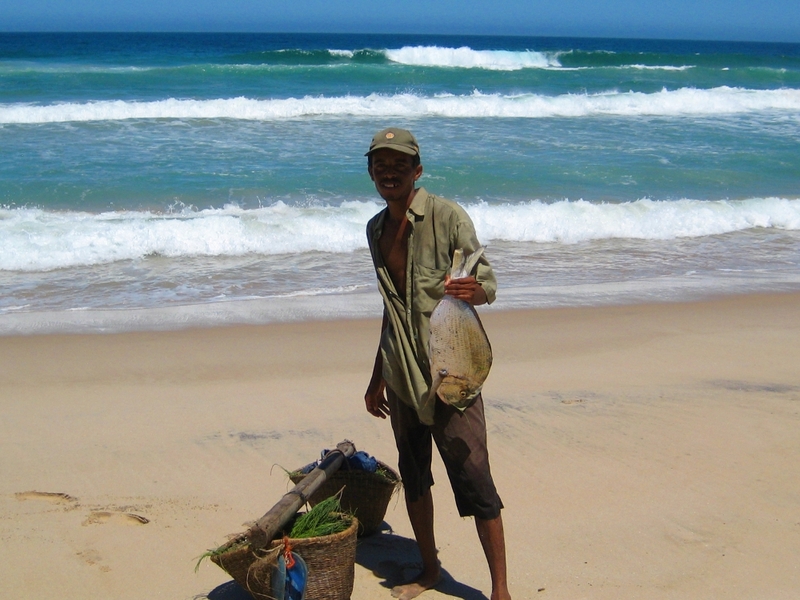 Amazingly in the sun, but they had to reach the market of Fort Dauphin early enough to sell their fish. And afterwards they walk/jog back to their village. Which is easily 20km far away. We were deeply impressed and sorry that we couldn’t buy the fish as we had no kitchen in our apartment. The next day we wanted to go more upcountry to see the mountains, villages and everything around. Luckily it was raining the weeks before so we had some amazing paddles. A local told us that the village Evatra has been cut off the rest of the country for 2 weeks because the bridge hasn’t been repaired. When we drove there some workers started rebuilding the “bridge”. 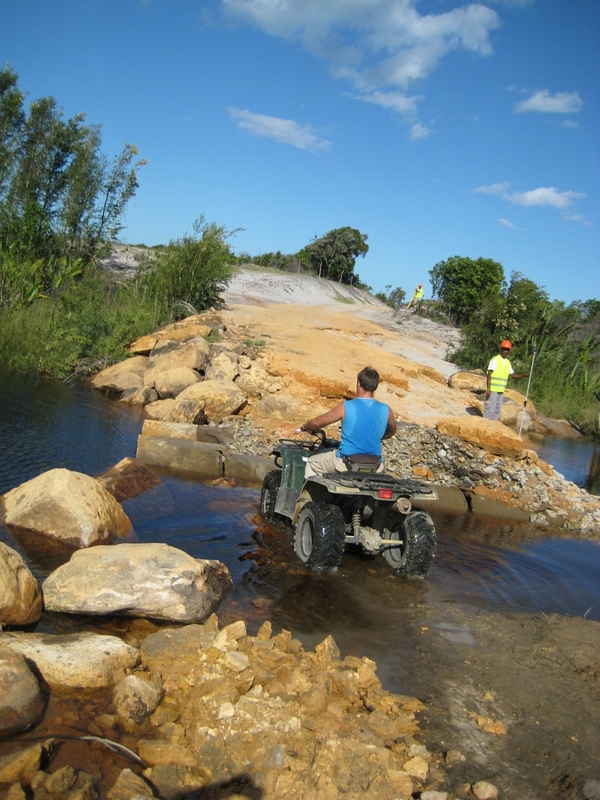 It was difficult at first to drive through the river and up on the original bridge again. Finally we made it with a lot of adrenaline in our blood. In Evatra locals looked at us as if we would have been aliens. Nobody ever drove through that village with their quads. We didn’t have a guide, but nevertheless felt always safe. Such friendly and trust worthy people even helped us out with a rope to tow one quad home. No fuel in mine anymore. 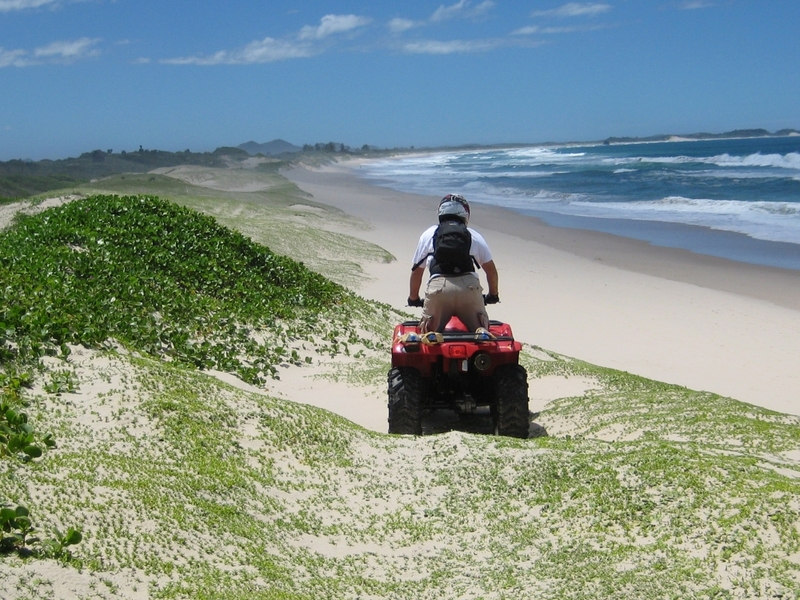 Fort Dauphin ended up being the best destination for exploring the seaside and the heartland. All tracks were perfect and without any danger. One day I took a local with me, who wandered next to the street. He had quite a long way and was stunned by my offer to hop on. For individuals like us Fort Dauphin provided everything we needed: amazing yummy local food, mountains, the stunning seaside and a nice choice of self-catering accommodations. The yummy food walked around guided by one herder, enjoying the sun and happiness before landing on our plate. Let me introduce you to the Zebu. Fine and tender. 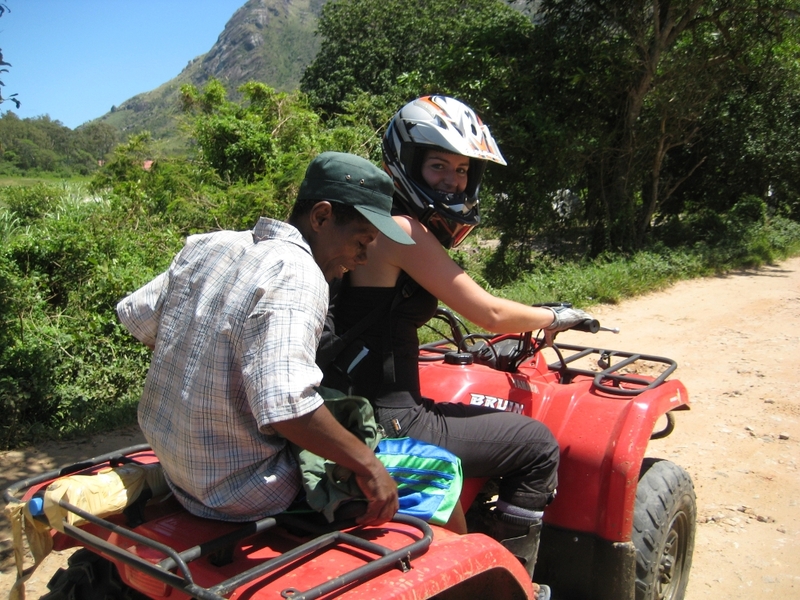 I enjoyed reading about (and viewing the photos) of your Fort Dauphin adventure. 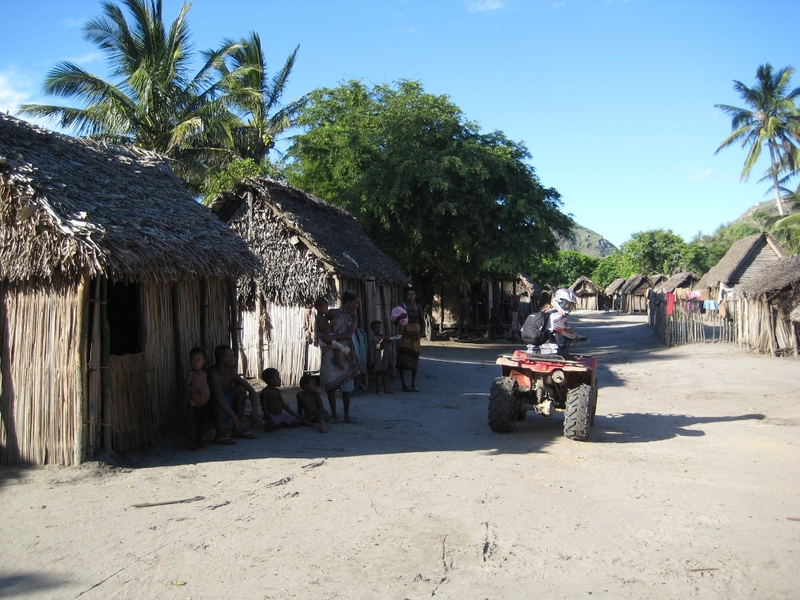 I was in Madagascar in 2004 and will be returning on Nov 2nd. 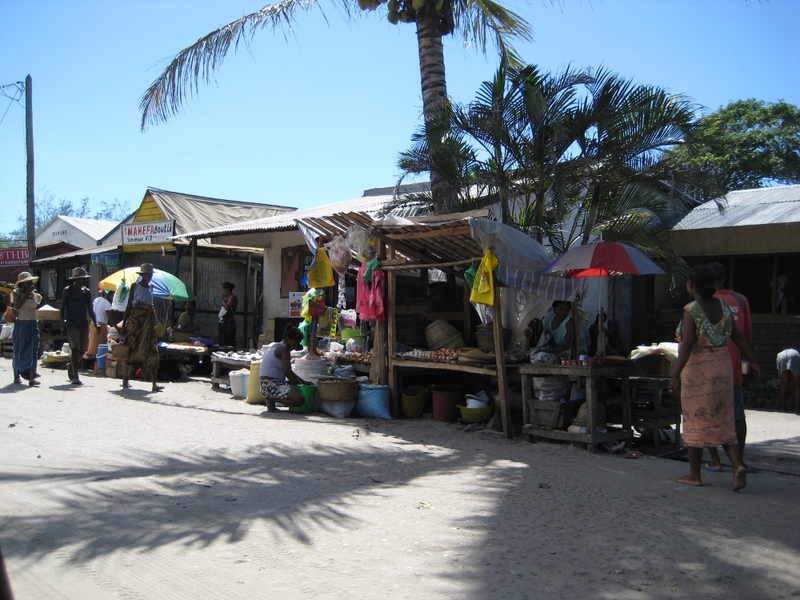 This time to the Ambola (Lake Tsimanampetsotsa) area, Fort Dauphin, then to Ile d’ Sainte Marie. Just this evening I thought renting a motorcycle to go to those beaches that are ‘way off the beaten path’. 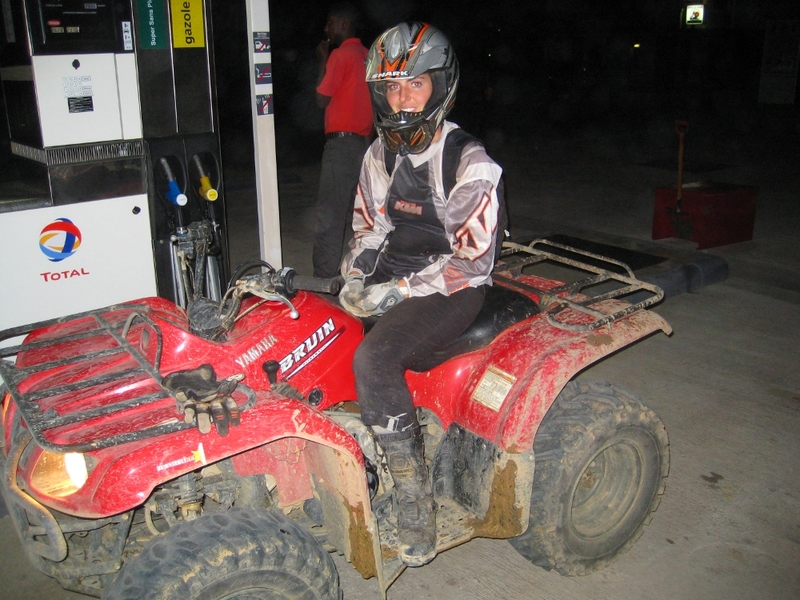 Now I’m considering renting a Quad.- (thnaks to your posting). I have more questions. would you please e-mail me back if you get this in time?